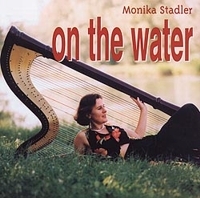 This CD by Monika Stadler (Harp & Voice) features Michael Dallinger (Cello), Reinhard Ziegerhofer (Acoustic Bass) and Franz Schmuck (Percussion). Besides Luiz Bonfi's "Black Orfeus" and a traditional ("Irish Whiskey"), all tunes are composed and arranged by Monika Stadler. With my music I would like to create a counterbalance to our hectic, matter of fact techno world that is alienated from nature, I invite you to enter into another world and relax. My music has its source in the so called female principle, the connectedness with nature, the rhythms of life, the experience of inner and outer moods and in silence. Sitting with a small Troubadour harp on the banks of a beautiful lake in the woods of Maine, USA, I opened myself to the peacefulness of the place and let it flow into my improvisation. "On the water" emerged from this improvisation. The bubbly cheerfulness of my niece served as an inspiration to this playful tune. These two compositions are my contribution to a CD-project sponsered by the cultural center of Russbach (co-produced by Austrian Broadcasting) where a number of musicians were asked to capture the atmosphere of the village Russbach in the mountains. "It's so Easy" expresses the swinging holiday mood of summer in this village, while "Nature's Beauty" grew out of a feeling of being one nature which I experienced during a stroll on the outskirts of the village. My musical journey now leads me into colaboration with other musicians. This colaboration helps me extend my possibilities of expression. The deep dark sound of the cello in this composition evokes the melancholic character of a bog-like lake in the ,,Waldviertel,, (part of lower Austria). I became interested in exploring Irish music after being invited to play a live radio performance at a folk club in Cambridge, Massachusetts, USA. I hope you enjoy this musical trip into another world! This recording is dedicated to David Kahn. Without his love and suport this record wouldn't exist. Alexander Slabihoud, Maria Stadler, Eric & Charlotte Spitzer, Brigitte & Peter Ratzenbeck, Brigitte Pressler, my parents. With the kind support of the Kulturamt der Stadt Linz. The harp used for this recording is a Horngacer, Nr.711 Modell Zabaleta, built 1989. All titles are composed and arranged by Monika Stadler except "Black Orfeus" composed by Louis Bonfi.